You want your office to run smoothly, but things will only go downhill if your employees are complaining of back pain and other ailments because of long hours at a desk with a computer. In order to practice wellness and remain comfortable on the job, you need your office to have good ergonomics. How can you accomplish the ergonomics you want in order to reduce people’s pain and heighten productivity and happiness? Here are a few tips. There are a lot of different chairs on the market and some are better than others. By investing in good, ergonomic chairs that can be adjusted to support each individual in a different manner, you are making a smart investment in your company. The less pain employees feel from sitting and working, the more they will be willing to do. Giving them comfort will open up a whole new level of productivity and give them happiness as well. 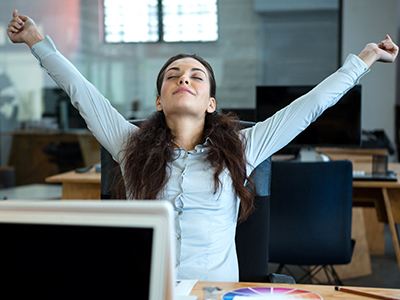 Encourage your employees to take frequent breaks in order to get up, stretch, and move around. This will help with ergonomics and soreness as well as stiff muscles. Perhaps it would be a good idea to put a program into place that encouraged employees to take hourly breaks for a few minutes. They can walk down the hall, fill their water glass, and stretch their legs a bit. Communication is key when it comes to finding the right balance with ergonomics. In order to find the right mix, ask your employees what they find wrong with the ergonomics in the office. The problems that come up could easily be solved and it is a lot easier to ask the source than to fix things that aren’t really necessary. There are plenty of things you can try and fix on your own, but if you really want to know what you need to change for sure, hiring an ergonomics consultant can help. Having a professional come in allows you to evaluate the specifics in the workplace and figure out where you can improve ergonomics. A consultant will bring years of experience and expertise to your office in order to take a look at what your employees may be experiencing. If you really want to improve ergonomics, hiring a consultant may be key. Keep in mind that the happier and healthier your employees are, the more eager they are to work and they more productive they’ll be. In order to work with E3 Consulting in regards to ergonomics, it is a good idea to take the 3-5 minute online web survey in order to identify if you are low, moderate, or high risk when it comes to ergonomic problems in your office. The evaluation will go through background information, work habits, tasks employees perform, tools needed, and it can also give forecasting and planning requirements that are based on ergonomic standards. You will get a snapshot of the organization and this will help the professionals aid your ergonomic wants and needs.